HEXED are a Swedish Metal band fronted by the amazing vocalist Tina Gunnarsson. The music is a genius blend of thick driving rhythms, melodic guitars and are sometimes progressively orientated, but always with catchy chorus lines and strong powerful female vocals. HEXED was formed in 2015 by vocalist/songwriter Tina and lead-guitarist/ songwriter Stellan Gunnarsson in Uppsala, Sweden. Both of them played in several bands before and had an early history in the metalscene and of music composing. Now they wanted to create and write music together, something completely new. They started writing songs and soon they knew exactly what kind of sound they were aiming for. Since both of them had the source of inspiration from bands such as Queensrÿche, Crimson Glory and Pagans Mind they knew that they wanted to create metal music with focus on strong and powerful vocals combined with melodic guitars. When they had the songs ready and the preproduction was about to start they had to find members who got the qualitys required to setup the band. The driven bassplayer Daniel Håkansson who played earlier in other metal bands, were chosen to take place along with the experienced musician Teddy Möller on drums. HEXED was now formed and complete as a band. The debut single and lyric video release ”Dreams” was launched in the beginning of May 2016. Meanwhile the album ”Netherworld” was recorded and produced in 2017, HEXED released their second official musicvideo ”Exhaling Life”. This song and video contains guestvocals from Thomas Vikström and it is filmed and produced by the talented Magnus Ewald who also produced videos for Liv Sin, Crucified Barbara, Firespawn etc. ”Exhaling Life” was also released as a limited edition promo EP in March 2017. The interest and response for HEXED after the releases have been overwhelming. HEXED got several proposals to consider and are very proud for the decision to sign a worldwide deal with Thomas Hörnkvist and ViciSolum Productions. This swedish label already have several established bands in its row, such as Persefone, Loch Vostok and Divine Ascension. 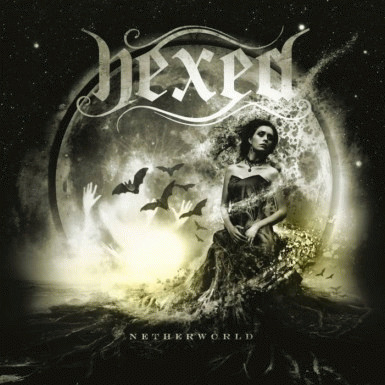 HEXED debut album ”Netherworld” are going to be released in March 30 2018 and the album contains 10 tracks and will be available on all major stores. The album is produced and recorded by Stellan at Blueflame and Hexed Studios, all vocals are produced and recorded together with the experienced Tord ”Diztord” Bäckström at TB Music productions. The album is mastered by Stellan and the mighty Jouni Niemi at Big Jambo Studios. All the awesome cover art for the album ”Netherworld” are made by the fantastic Mattias Norén at ProgArt Media who also made covers for amazing bands like Epica, Kamelot and Evergrey. Stay Updated by following the HEXED public pages for upcoming gigs and news. In due time, metal fans around the globe will be split into two groups, those who already are HEXED and those who are about to be!……Are you HEXED yet?! !